At last, a stylish energy saving dual light level outdoor security light, featuring a built in photocell and PIR movement sensor. 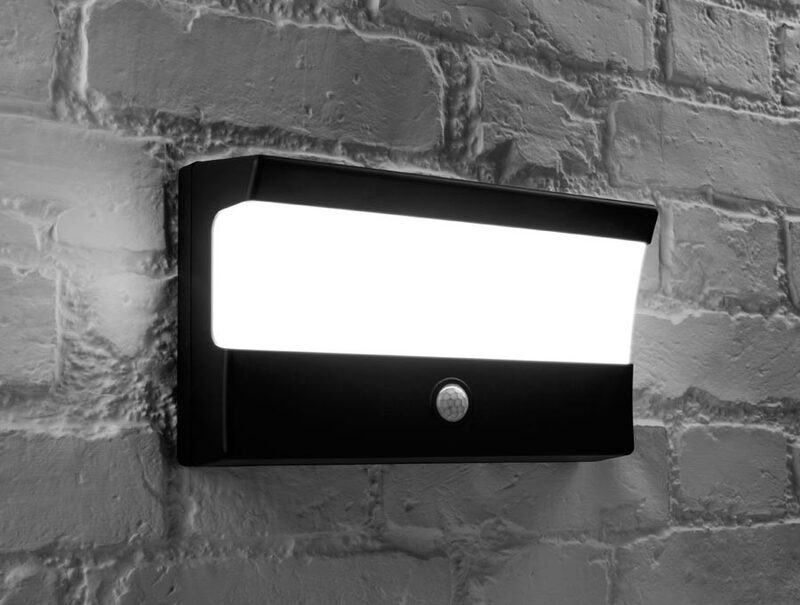 A modern, black finish, landscape orientated, energy saving, daylight white LED outdoor wall light, with an aluminium wall mount and polycarbonate fascia and wrap-around diffuser for an all over softer light. The photocell switched the light on at low level during the hours of darkness using just 2w of power. The moment the PIR is activated, it switches to full 16w brightness and gives a very impressive 430 lumens of light. Fully adjustable photocell that enables you to adjust the light level at which the wall light operates. The PIR has a range of 2 – 8m and is adjustable for time between 15 seconds and 4 minutes. Designed in the UK using high-powered Epistar LEDs and British designed driver unit to deliver bright, energy saving light. Rated IP65 with a two-year warranty. Quality Epistar LEDs output 430 lumens of light. Automatic low-level lighting from dusk to dawn. Switches to full 16w brightness when PIR detects movement. Built-in adjustable PIR with 2 – 8m range. Rated IP65 and suitable for outdoor use. LED lifespan of up to 50,000 hours. Hi Pc. The fitting has an LED array rather than a lamp so is not replaceable, although it does offer an average life of 50,000hours so is unlikely to fail. Electricity voltage spikes won’t be an issue. Is it possible to override the PIR so the brighter light can remain on, such as if we were sitting out in the garden on an evening/ night?